High cholesterol is one of the leading causes of heart disease today. Individuals with clogged arteries may have to undergo dangerous and invasive surgeries to undo the damage from years of poor diet and genetics. Even after heart bypass surgery, stints, or other procedures, it is important to consume a diet that will not cause the plaque in the arteries to return. While some of your favorite foods may appear below under Foods to avoid or Limit, it is important to understand that there are plenty of healthy and tasty alternatives that will make your heart healthier. Healthy diet low in cholesterol can reduce levels by 10% to 30%. Studies show that heart health and cholesterol levels can be improved in a relatively short period while eating a diet rich with green leafy vegetables, complex carbohydrates, lean meats, fruits, and nuts. The big challenge with switching gears and opting for healthy foods is that you must clear your office and your home of potential triggers. Do away with processed foods and foods that are made from refined sugars and white flour. Substitute instead foods high in fiber that will help you feel satisfied longer while the food is working diligently to remove the cholesterol from your arteries. In as little as 30 days, if you refrain from eating high-fat, high calorie foods, you should see a noticeable difference in your cholesterol numbers. Nuts are a great snack or addition to breakfasts or salads. 1.5 ounces a day of almonds, walnuts, pecans, pistachios or walnuts will help your body fight cholesterol. The polyunsaturated fatty acids found in some nuts help to keep blood vessels healthy and strong. 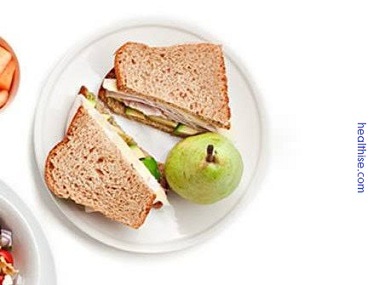 Along with nuts one can also try sandwich specially prepared to fulfill taste and lower cholesterol. Want to cut cholesterol without cutting taste? Most people are afraid that “good for my cholesterol” means meals that are joyless (and tasteless). However, a low-cholesterol diet doesn’t have to be all oat bran and tofu. The sandwich is a staple dish when it comes to lunch or dinnertime dining. They are quick to make and can be constructed with a variety of ingredients to satisfy almost any craving. Although having high cholesterol doesn’t eliminate this delicious food from your diet, you still need to be careful about which foods you add to your sandwich. Adding the wrong ingredients could cause an increase in your cholesterol levels – and your waistline. Choose whole grains.Instead of choosing white refined breads for your sandwich, opt for whole grain breads. These are high in fiber, which can help keep your cholesterol levels healthy. Examples of whole grain breads include whole wheat bread and twelve grain bread. Look at the carbohydrate and fiber content. Another tell-tale sign of a healthy bread is its carbohydrate and fiber content. Ideally, the bread should be high in fiber, and have minimal refined sugars. Mix it up. Bored with the traditional sandwich? Try wrapping some ingredients in lettuce or make a wrap containing your favorite ingredients. Another healthy alternative would be stuffing your favorite sandwich fillings into a whole wheat pita pocket. The heart of the sandwich can consist of practically anything. However, it is this section of the sandwich that can also pack on additional calories and fat – both of which can affect your cholesterol levels. Vegetables – You can never have too many of these on your sandwich. In fact, you should make it a point to include a few vegetables on any sandwich you make. Vegetables can add texture and flavor to the sandwich. Additionally, veggies contain phytosterols and other healthy chemicals, which can help lower your LDL cholesterol. Although lettuce and tomato are the classic additions chosen for sandwiches, practically any vegetable can be added to a sandwich. Needing something a little different? Add sprouts or spinach instead of lettuce. Rather than your traditional tomato, add sliced cucumber, shredded carrots, black olives, a slice of avocado or onion to your next sandwich fare. Better yet, why not add all of these ingredients? Fruit – Although not as popular of a choice as veggies, fruits can add flavor to an otherwise dull sandwich – especially if you are craving something a little bit sweeter. Chopped apples, diced cranberries, halved grapes, or citrus fruits can make a tasty – and healthy – addition to your sandwich. Cheeses – Cheese can be a good source of calcium – and saturated fat. When looking for cheeses to go on your sandwich, try opting for low fat cheeses over others. The possibilities for constructing the perfect, cholesterol diet-friendly sandwich are endless given the variety of healthy foods available to you. Combining your sandwich with healthy side items will not only ensure a tasty and filling meal – it will also help keep your heart healthy. Food high in cholesterol include: >> Kidney. >> Liver. >> Sweetbreads. >> Shellfish such as lobster and prawns. There are some foods that should be taken in moderation as they can contribute to a high level of cholesterol in the blood. Most heart patients avoid them completely. Even healthy people should do the same. These include: >> Meats such as fatty bacon and pork, sausages and black and white pudding. >> Cooking fats including lard, dripping and vegetable oils. >> Butter, margarine and other spreads. >> Milk. >> Cream, ice cream, artificial creams and sweet yogurts. >> Thick and creamy soups. >> Rich sauces and gravies, mayonnaise, and salad cream. >> Cheese – choose medium and low-fat varieties, and use as an alternative to meat at a meal. >> Eggs – use a maximum of 4 to 6 a week. >> White bread and other white flour products. >> Sugar, jam, soft drinks and sweet foods generally. >> Foods which contain the above as ingredients, such as pastries, cakes, rich biscuits, chocolate, toffees and sweets. Is a deli sandwich healthy ? Lets say a hero with pepper turkey lettice tomato cheese and light mayo. I dont see whats wrong with that ? Is it healthy or unhealthy ? How many calories is it roughly ?